Welcome to the Outdoor Education Center, Clear Lake Camp! The origins of the Battle Creek Public’s School’s Outdoor Education Center are closely connected with those of the Kellogg Foundation. When the W.K. Kellogg Foundation was established in 1930, one of its goals was to promote better health for children: three camps were soon initiated in southern Michigan for that purpose. In 1932 facilities at Pine Lake were used for summer camping for children. In 1933 the Foundation program expanded into winter camping. The Clear Lake Camp site was acquired from the Campfire Girls of Battle Creek. The Foundation added to the land, constructed a main lodge similar to Pine Lake’s and began using the camp during the winter months. 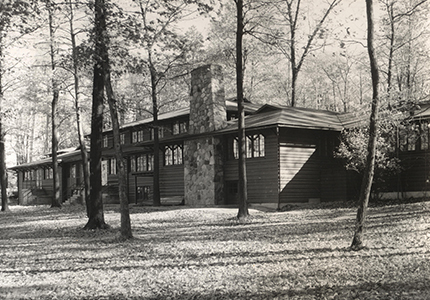 In 1937 the Foundation began to use a third camp, St. Mary’s Lake, for winter camping. The first public school camp was initiated on an experimental basis at Clear Lake during the school year 1940-41.Favorable results of the earlier welfare camp efforts along with the growing concern of educators about the whole-child development prompted the Kellogg Foundation, in 1940, to propose another experiment in educational camping. Public school personnel in Michigan were invited to participate in demonstrating the effectiveness of community and school programs. The outdoor education center experiment was interrupted by World War II when the camp at Clear Lake was used by the U.S. Coast Guard for training purposes from 1942 to 1945. Following the war, the Battle Creek Public Schools and nearby districts expanded their activity in school camping; of the three original camps involved, Clear Lake eventually became the setting where all of the school camping took place. In 1947, the Battle Creek Public Schools assumed the major responsibility for operating Clear Lake Camp. In 1957, the Kellogg Foundation deeded the property and facilities to the Battle Creek Public Schools to continue the now well established program in outdoor education. At this time the main lodge was renovated, and two new dormitories were constructed. In the early 60’s, the board of education purchased adjacent property to expand the site to approximately 140 acres. In 1966, the name was changed to the Battle Creek Outdoor Education Center. Though the camp is part of a much larger complex, the camp site is still referred to as Clear Lake Camp. In 1967, the Farm Garden Program is transferred from its Battle Creek location and joined the School Camp Program as a second major program operation on the newly expanded Outdoor Education Center site. At that time, the development of a 100 acre farm was begun, and a building with three classrooms was constructed. These new facilities, along with an existing barn and farm house, provided the nucleus for the Farm Garden Program. The total program has now evolved from a fifth-sixth grade school camping involvement to a comprehensive outdoor education program involving 2,000 children annually in grades one through twelve from districts all over Michigan including Battle Creek Public Schools.